With over 40 integrations, Sematext application and IT infrastructure monitoring platform lets you collect metrics and events across your whole stack. Get started in minutes with out-of-the-box dashboards, alerts and anomaly detection rules, and ability to analyze your metrics by a number of context-aware filters. Register for free or Login into Sematext IT systems monitoring platform to get started and create your monitoring app with over 40 monitoring integrations available. This guide will help you get started with our APM service and discover reporting, monitoring, and other application features and functionalities. Image below shows the default monitoring view and marked are the main application and system UI elements. Side navigation is peristent UI region that can be collapsed / toggled on or off for full reports view, and is used to easily switch across monitoring, log management, transaction tracing, real user monitoring, and other user & team system features. All side navigation options are selectable at all times and the right aligned chevrons indicate that the top level section is collapsible and contains additional subitems. as user and team Sematext Cloud system features. The App & Dash dropdown Selector lets you choose any logging or monitoring app as well as any dashboard report(s) that you have generated from those apps. Moreover, infrastructure views such as AppMap, NetMap, Servers, and Containers are also available for selection, and together provide seamless switching and navigation between logging, and app & IT infrastructure monitoring, essential when rushing to fix IT production issues. Right next to the App & Dash Selector is the App Actions dropdown menu, horizontal elipsis icon, opening various app specific functions, namely instructions to install monitor and start sending your metrics, app settings, alert rules, heartbeat alert creation as well as ability to connect two different apps, invite team members, and transfer app ownership. All App Actions open in a modal dialogue window as temporary UI regions and let you adjust and edit settings or create various alerts. App view remains unchanged and allows for easy interaction between various system settings and reports view. 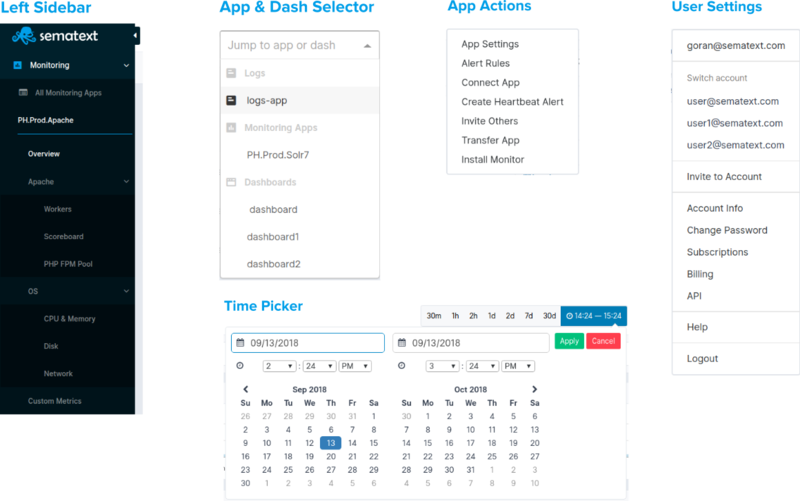 Time Picker is available whenever logging or monitoring app is selected as well as any generated dashboards are being used. One minute is the shortest time increment user can select. Thirty minutes, one and two hour, and one, two, seven, and thirty days time span shortcuts are exposed for easy common observability. Custom time range can be selected using the time picker dropdown menu. App will automatically refresh upon selection and update all the reports in view accordingly. Refresh data and Live Tail / Stop auto-refresh data options are additional time specific features and located next to the time picker. Live Tail feature provides real-time insights as soon as your data is consumed and indexed, and all the data is automatically refreshed. It can be also stopped so no automatic refreshing takes place in case your devops team needs to inspect specific incident or anomaly within a certain time segment. Bell icon in the right section of the header is used to open system notifications messaging modal window. If your plan needs upgrading, a new feature is announced, and other such system or service messages will be shown in the notifications view, and may or may not require user action. Last, but not the least User Settings is the last right aligned item in the app header UI. Account switching features, Invitations to other devops team members, Billing, Help, and other user related system functionalities are located in the user settings dropdown menu. They are also top level items easily accessible from the left sidebar. 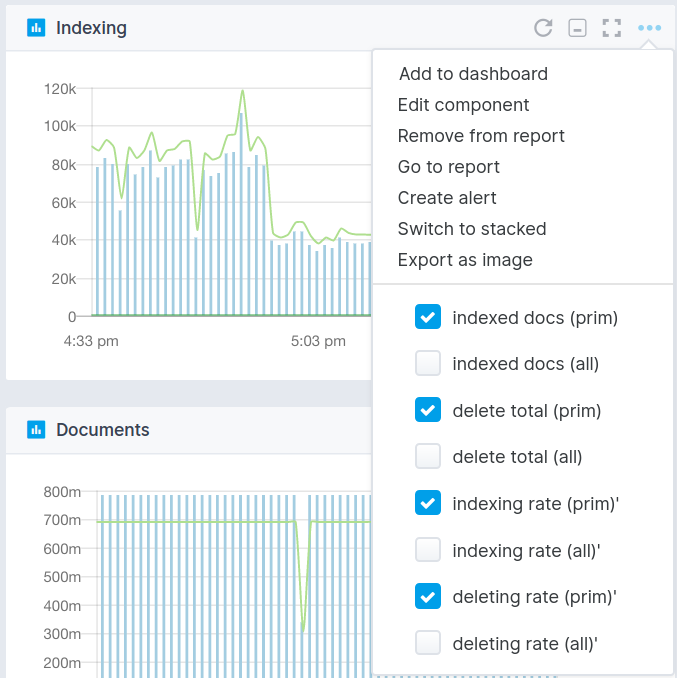 The next section describes the monitoring report menu located just below the top navigation menu, and help you discover how to add new components, correlate your logs and events with your monitoring app, do report specific actions, connect your apps, and more. Monitoring Report Menu is where the true power of Sematext APM platform and the whole stack observability comes to life. Events and logs are integrated in a single monitoring reports pane, and used to correlate metrics with application and server logs, events, alerts, anomalies, and more. Image below shows the report menu in detail followed by explanation on how to use these features. See any metric and any logs in a single unified view, add additional components to your metrics reports, share reports, and more. When your app is initially loaded, Save and Reset buttons will be hidden since that is app's default state and there is no need for changes to be saved or reset. If a new component is added or any existing component is edited, alert created, and report component removed, Save and Reset button will appear in the report menu and allow for changes to be saved or reset to the initial state. If your browser is suddenly closed, and no changes were saved or reset, app will preserve the initial state. Correlations feature is essential system part designed to provide a single pane of glass that provides full IT systems observability. Sematext team pioneered unification of logging and monitoring devops tools into a single app view, and continue to do so with the integration of events into correlations. Moreover, with the new RUM (Real User Monitoring) functionality we seek to create a Suite of Enterprise IT Tools that provide instant ROI and help your devops team bring your servers, apps, metrics ,logs, events, and alerts together. This is really cool and a huge time saver. Empower your IT system administrators to go from metric spikes to your apps’ and servers’ logs in seconds, find similar metric patterns with built-in metric correlation, get to the root cause in minutes, and see any metric any logs in a single unified view! Image below shows correlations and Events toggle selected for Apache Logs app in the same view together with Apache Monitoring app used to analyze various server metrics data using build in reports and data visualizations tools. Two apps were initially created, one for Apache sever logs and the other as Apache Monitoring Integration, and combined provide a full insight into server anomalies or incidents. When the Event correlation is selected in the report menu, the Event Search component is loaded with search input, App Selector used to select an app and app's data you want to load and correlate, and events histogram displaying bar chart across the time frame selected in the time picker above. Component's contextual menu items are located as a series of icons next to the App Selector. The first one opens Event Stream component below the Event Search component and provides the list view of every event, timestamp, details, event type tag(s), and event description. Combined with the metric reports below, and with the help of charting hairline, zoom and chart navigation tools, it is easy to see how using our APM and Logging tools in a single pane is a must have for any modern IT enterprise. Next, let's take a look at the Logs correlations and how to utilize them together with metric reports as well as events. Just like the Events correlation view, turning on Logs correlation in the Reports Menu will display Logs Search componenet with search input, App Selector, and the series of icons used to expand log table, open logs component contextual menu, and other related settings and features as shown in the image below. Clicking on the Logs icon will open logs data table component view below the Logs Search component. List view of log entries will be displayed with @timestamp, _source, and Tags as default columns, but all available logs fields will be available in Logs Table component dropdown menu, and easily selected or deselected and displayed in data table view. Column width can be also resized to better organize Log Table when multiple fields are selected at once. Every Log entry in the table has two left aligned icons, one that opens panel with all log details, and the other that opens Log context. Contextual logging is an approach that encourages not just adding additional useful data to log events, but also sharing that data across related events. Email Report - There are Email and Subscription types available with time, frequency, and time range defined so your devops can get automatated reports for comparative and incremental app & infrastructure monitoring analysis. Full Screen Mode - Entering full screen mode brings only that component into a view and removes all other app's UI elements. It is useful for group and team presentations as well as specific and detailed view of a single component, showing detailed metrics visualizations. All charts have zoom, hairline, and time navigation tools with tooltips available for effective chart interaction and data analysis. 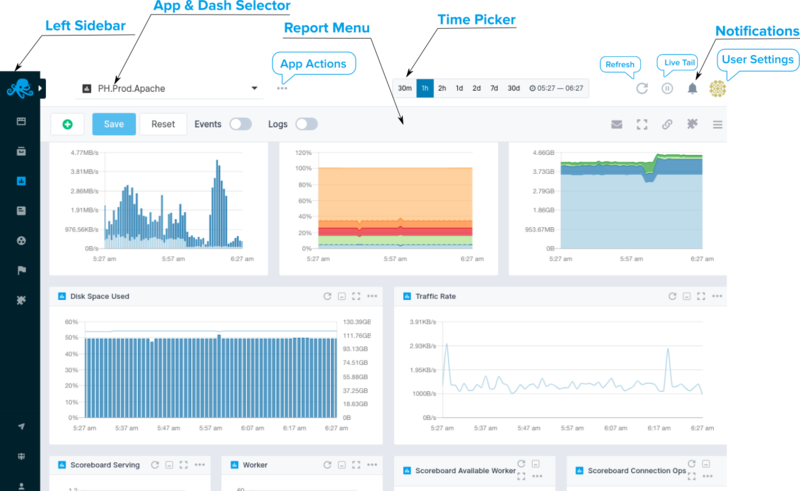 Connected Applications - Connecting a logs app to a monitoring app will pre-select that logs app when you decide to correlate metrics from the connected monitoring app, and thus save you time. When you receive an alert notification for an app, the alert notification will automatically include information (e.g. charts) from connected apps, and thus provide more information and context for you. You can connect any two apps you have access to, regardless of their type. A single app can be connected to any number of other apps. Monitor Installation - You will need to install Sematext agent so metrics or logs data can be forwarded to our logs, app & infrastructure monitoring SaaS service. Please refer to Integrations documentation pages for particular tech you wish to monitor, and learn more about how to monitor various programming languages, operating systems, containers (Docker, Kubernetes, Mesos), Cloud IaaS / PaaS services, iOS, Android, AWS EC2, AWS s3, and logging management service and log shippers available. There you will find detailed information on how to install and configure different agents required to start sending your logs and metrics data to Sematext Cloud. Report Actions - Your customized monitoring report can be better described using meta name and description, and you can assign unique URL Alias to identify that report. Legends Position and Extended Charts features - Except in app default overview mode, each report can have legends (each metric name) arranged below, to the left or can be hidden for better chart interaction. Extended charts are also displayed below and provide comparative view into longer time span relative to the time frame displayed in the main chart above. Just like report legends, extended view can be hidden and only the chart with x and y values displayed. Using custom components your whole devops team can add monitoring metrics time series, events count time series, events, markdown notes, and create custom reports with rich data visualizations and chart tools to analyze your data. There are both APM & Logging common as well as logs or monitoring specific components, and they will be contextually available depending on whether it is monitoring or logs app. Each component can be also added to custom dashboards defined by the system administrator or other devops and data analytics professionals. Line, Area, Bar charts binned by metric creation date, bar chart binned by event creation date, table of events in reverse chronological order, as well as additional logging components that can be added to your logs app are available. Use them together with out of the box metrics reports and visualizations, generated when your app is created, and you will go from metric spikes to your apps’ and servers’ logs in seconds and get to the root cause in minutes. Forget about ssh-ing to servers and grepping logs and find similar metric patterns with built-in metric correlations. 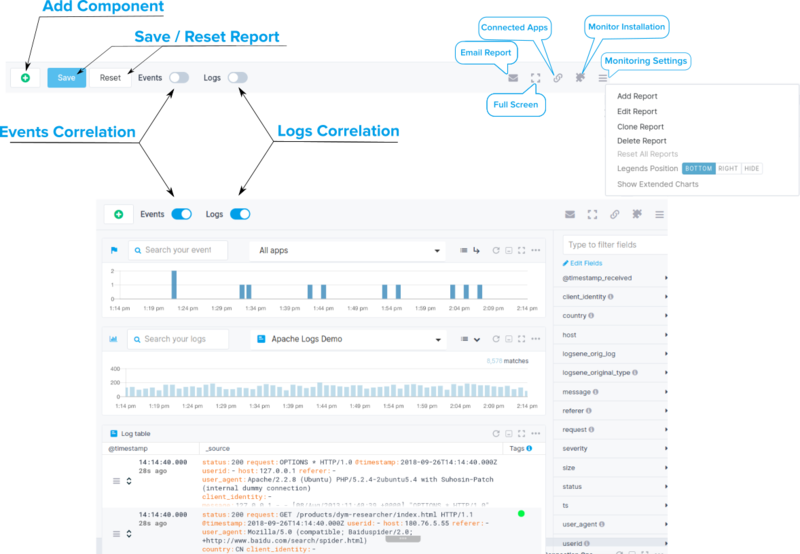 Each Component can be added to a custom Dashboard, and you can organize devops or business reports from one or several applications, both logging as well as monitoring, and create rich data and visualization reports based on various metrics and logs data.